Please note all timings are approximate and subject to change to on the night. From his early days in the 1960’s as a singer and engineer for Coxsone Dodd’s Studio One in Kingston, through his production of the seminal Wailers’ classics African Herbsman and Soul Revolution, Perry’s innovative style marks him as one of reggae’s original treasures. His on the edge creative genius remains evident in his own solo albums of the 1970’s through his steady stream of mind-boggling releases of the 1980’s. Always one to follow the beat of his own drummers, the eccentric genius Perry continues to break new ground with the hardest rebel Rasta tunes and the most unpredictable instrumental dubs. Lee Perry has most recently been touring Europe, riveting both old and new fans with a full measure of his blessings. The “Upsetter” charges forward making music that recalls African roots, at the same time, it reaches for the vastness of the outer space. Lee is perhaps the only 80 + year old that can dance on one leg for 1 hour straight! 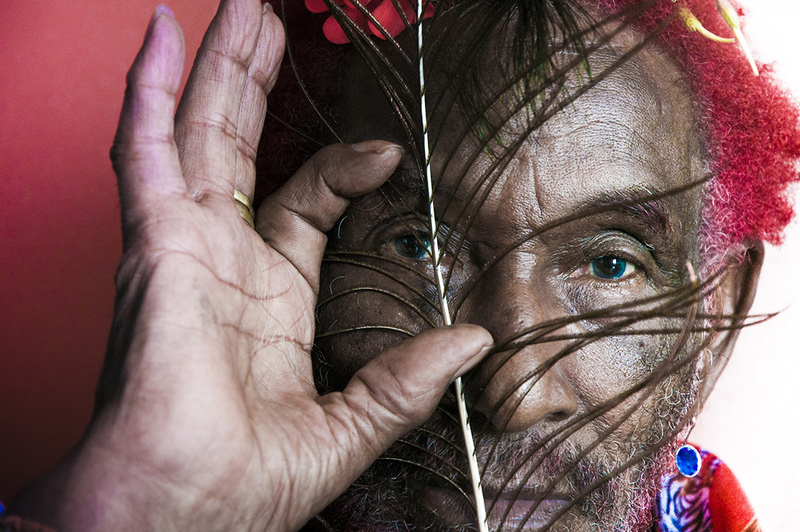 One of reggae’s undisputed pioneers, Lee “the Upsetter” Perry has worked with almost everyone from the Heptones to the Skatalites to the Clash. Certainly one of his most notable contributions was the pairing of Bob Marley, to Peter Tosh, and Bunny Wailer with the Barnet Brothers (Carley and “Familyman” who had been the heart of the Perry’s group, the Upsetters) and thus the forming of the Bob Marley and the Wailers. After his own studio, “Black Ark,” burned to the ground in the late 1970’s, Perry laid low for a while, only to resurface with a vengeance in England in the mid-1980’s. He went back into the studio with a variety of partners, from Adrian Sherwood to Terence Trent D’Arby. During this time, Perry took up residence in the Swiss Alps (“The mountains give me the fresh Swiss air to replenish my structure so I can soon join the immortal race”). Proof positive that talent on this scale will win out no matter what, since the “madman” has come down from the mountain, the World Music market has been gifted with more Lee Perry Product. Perry’s stream of consciousness rants have been called the babblings of the lunatic by some to the offerings of a prophet by others. Either way, his unique dubbing style is infectious. Often, the words are broken down into their purest elements, sound and feeling. Perry’s groundbreaking use of sound effects, echo reverb, and rewind adds a new dimension to the folk tradition of Reggae and has influenced countless other artists. In his plethora of newer material, “Scratch” expounds on his favourite themes of extraterrestrials, judgment, justice, corruption, carnality, and self proclamation, all over some killer riddims. Trojan Records and Tru Thoughts are proud to announce the launch of their collaboration with a special show at De La Warr Pavilion, Bexhill-on-Sea featuring back-to-back dj sets from Farsteppa (Trojan Records) and Wrongtom (Tru Thoughts) followed by a live performance from the legendary Lee “Scratch” Perry. Founded in 1968, Trojan Records was the UK’s leading record label to ignite the reggae explosion that had swept across the country by the end of the sixties. Much has changed in 50 years, yet despite the rise and fall of numerous music trends and the development of new formats on which music can be acquired, Trojan Records has consistently maintained a significant and relevant presence in an ever-competitive market. With a vast wealth of music at its disposal, there is no doubt that the label will continue to do so for many, many years to come. Founded in Brighton, UK in 1999 by Robert Luis and later joined by Paul Jonas, Tru Thoughts has established an international reputation for releasing a wide variety of high quality music in its nineteen plus years of running. Since the acclaimed first album release of Bonobo’s debut ‘Animal Magic’, the label has put out over two hundred LPs, across genres from electronic, funk, soul and hip hop to jazz, tropical, grime and more. Over the years, Tru Thoughts’ eclectic roster has included names such as Quantic, Alice Russell, Nostalgia 77, Rodney P, Hidden Orchestra, Flowdan, Zed Bias, Anchorsong, Moonchild and the Grammy-nominated Hot 8 Brass Band. Kicking off the night with a Trojan vs. Tru Thoughts DJ set are and Farsteppa and Wrongtom. Coming from the Trojan Records camp, Farsteppa has been in the reggae scene for over 10 years since he started collecting records in Prague. From organizing festivals and DJing around the UK, Czech Republic and Slovakia to co-running the Trojan label, Farsteppa is an intrinsic part of the reggae community. Genre-crossing, reggae-rooted producer Wrongtom is well known for his solo productions, DJ sets and collaborations including Roots Manuva, Django Django, Hard Fi, Deemas J and The Ragga Twins. From his beginnings in a jazz band, playing gigs throughout his native London and around the UK, this musical multi-tasker has made his name all over the world. Regarded with awe throughout the music world, Lee “Scratch” Perry takes to the stage as the evening’s headliner. Holding status as one of the most enduring and original reggae producers and artists of all time, from his early days in the 1960’s as a singer and engineer for Coxson Dodd’s Studio One in Kingston, through to his ground-breaking productions at his famed Black Ark studios, which pushed the boundaries way past their previously conceived limits. Always one to follow the beat of his own drummers, the eccentric genius Perry continues to break new ground with the hardest rebel Rasta tunes and the most unpredictable instrumental dubs. All this will be taking place on Friday 23rd November at the iconic De La Warr Pavilion in Bexhill-on-Sea. Conceived as a democratic space for art, culture and recreation, and as a hub for the wider community, the building’s design is unique, purposeful and progressive, embracing the international style while remaining quintessentially British. Named after the 9th Earl De La Warr, who was the driving force in its creation, the Pavilion was designed by Erich Mendelsohn and Serge Chermayeff and opened in 1935. Today it continues to be home to an ever-changing programme of established and emerging artists.